There's No Place Like Home: Chicken and A Parade! Today we met one of Katie's friends for lunch. Gunner and Katie met when they just turned one at Mother's Day Out. They bonded pretty instantly. And he was always a great comfort for Katie, who is sometimes a chicken baby at school. When we took Katie's pacifier away (before she was 2), she was calling out for Gunner in the middle of the night! Well he started a new school this year. 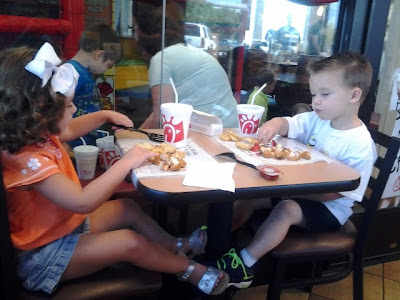 His mom said he was in utter shock that Katie Belle wasn't there on his first day. So we met for lunch so they could continue their friendship. They took it upon themselves to eat at their own table! They played so great together today. We will have to do it again soon! Tonight we went to a parade! One of the nearby high schools is having their homecoming this week. It's too early and too hot for homecoming, if you ask me, but nobody did. At first Katie was a little disappointed that they were trying to pass cars off as floats. I think she was expecting a Disney type of parade that we've seen on tv. Sorry Charlie! But this was her face when she realized they were throwing candy! She was on board with that! She loved it and we had lots of fun...free fun! How cute! Love those little friendships! Awww...Katie's first date!!! :D I hate to tell you that it will probably be the last one that she will allow you to even be in the same room with her! Lol I always love seeing her precious pics!